Learning a New Language is available at Amazon.com and other bookstores. 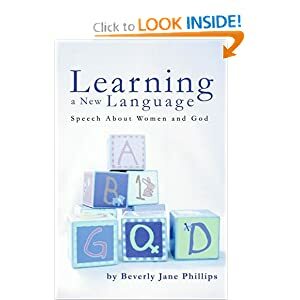 Learning A New Language, first published in 2005, explores feminine names for God. Nothing we can ever say about God, no words, will ever be adequate to describe the burning mystery which is the Divine, but opening up the vocabulary to include feminine names and pronouns will bring a dimension to our understanding of God that has been tragically neglected. The idea of SHE WHO IS brings to bear all the loving, care-giving, wisdom-supplying richness of the female created in God’s image. The reality of the feminine in God is an idea we must consider and wrestle with if justice for all is to be a reality in the world. We must learn a new language.